The foot carries the load of the whole body. It is said that the feet carry a total load of 15 tons when you walk 1 km. A 60 year old person would have walked approximately 160,000 km in their lifetime, which is four times longer than the circumference of the Earth. The feet are therefore very important, but are under constant stress. Heel pain is a very common symptom. It is more common in people whose occupations involve a lot of walking, dancing, tennis, basketball and other activities that put a heavy load on the feet. It is most commonly caused by inflammation of the plantar fascia that works as a spring at the bottom of the feet. It tends to occur more often in obese people, or those with flat feet or high arches. However, it can present with other diseases such as problems with the fat pad in the feet, or the bones, or with other diseases, so differentiating these conditions is important for treatment. The fat pads are pads made of fat tissue on the floor of the feet that have a unique structure. They function as a cushioning device for the feet. Shrinking of the fat pads can cause pain in the heels, which can present together with plantar fasciitis, but can also occur alone. The characteristics of pain caused by plantar fasciitis is that it is worst in the morning when you first start to walk, and is relieved by walking a few more steps. The pain can worsen during the afternoon. It is caused by chronic inflammation or damage to a structure called the plantar fascia in the feet. 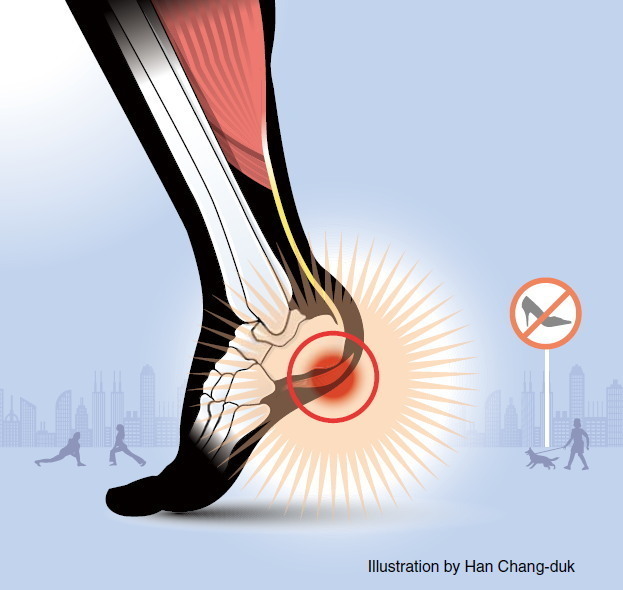 Treatment of plantar fasciitis should start with stretching exercises. This should be done 4-5 times a day and before going walking in the morning. Stretching alone can improve symptoms in 80 percent of patients within the first couple of months. The recommended exercise is to stand facing upstairs, place the balls of your feet on the edge of a stair and stand up, stretching the Achilles tendon. Putting heel pads inside the soles of your shoes, or using medial longitudinal tendon tapes can also be effective. Other foot orthosis (FO) can be used for various biomechanical properties of the feet. For example, for patients with flat feet or excessive pronation of the feet, shoes and FO that support the medial longitudinal arch can be prescribed. Patients with pes cavus can use shoes and FO that are soft and that absorb shock well. Plantar fasciitis can last for 8-12 weeks, so must be treated consistently. More recently, various studies have reported the use of different protocols and energy levels of external shock wave therapy. It is also important that you choose the right shoes to wear. 1. Heel height of 2.5-3 centimeters. ● High heels put a load on the front of the feet and the phalanx, which produces calluses and causes various foot conditions. ● Flat shoes do not provide sufficient cushioning to protect the feet when walking for long periods. ● These shoes can support the feet even when the shoes are not tight, to prevent the toes from splaying when walking. ● The soles and the lining should be made of material that absorbs shock. This is important to distribute the load on the feet. ● Shoes that retain moisture and sweat can lead to proliferation of bacteria and fungi (causing Athlete’s foot). ● Shoes with soft heels cannot absorb external shocks and cannot protect the feet biomechanically. ● Shoes that are too tight or small in width, or that are different to the shape of the arch of the feet can lead to diseases in the feet. 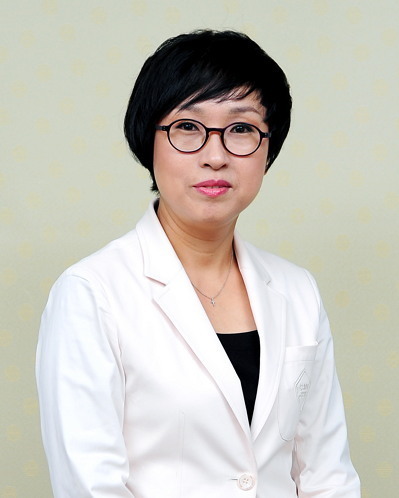 The author is a doctor at the department of physical and rehabilitation medicine at Samsung Medical Center and a professor at Sungkyunkwan University School of Medicine. ― Ed.